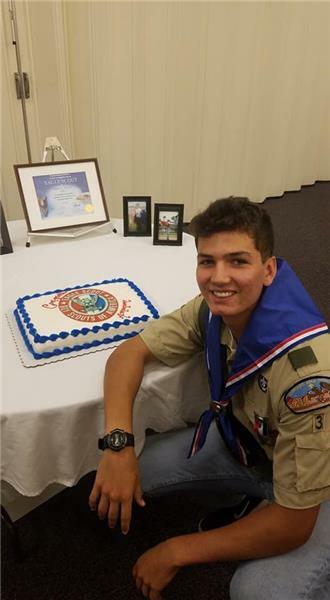 Ammon Murphy of Ringgold has earned his Eagle Scout award. 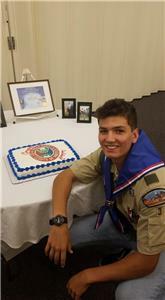 Only four percent of Boy Scouts earn the rank of Eagle Scout, after a lengthy review process. Requirements include earning at least 21 merit badges. Ammon is a 2018 graduate of Ringgold High School and played on the baseball team. For his Eagle project, Ammon organized and carried out a blood drive for the community. When asked how he chose his project Ammon said, "This project has been on mind ever since I found out about needing to do an Eagle project. “My favorite part of the project was seeing the community come together. I could not believe the turn out. Almost everyone I talked to was willing and happy to take just 25 minutes out of their day to help someone in their community. All the blood donated went to people only in our area." Ammon also shared some things he learned. “I never knew this,” he said, “but blood is needed 24/7 on a yearly basis. Four and a half million patients need blood transfusions each year in the U.S and Canada. It's really important to donate blood." Ammon said this project was really something he will never forget. Although he didn’t witness first-hand how the blood donated that day helped someone, he is thankful for the generosity of everyone who participated. He knows that they will be blessed for their service, and that the blood they donated will make a big difference in the lives of those who need it. Jesus Christ said, “Inasmuch as ye have done it unto one of the least of these my brethren, ye have done it unto me,” (Matthew 25:40). Jesus also taught us to love our neighbor. When we do, we will find joy. Ammon is the son of Chris and Abby Murphy. He has a younger brother, Logan. Ammon is currently serving a full-time mission for The Church of Jesus Christ of Latter-day Saints in Honduras.